Polished Peripherals: There can be only one! 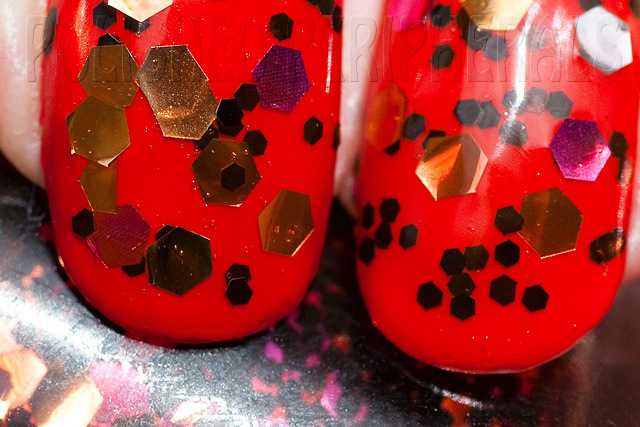 Happy Glitter Me Up Friday! OK so I'm late. 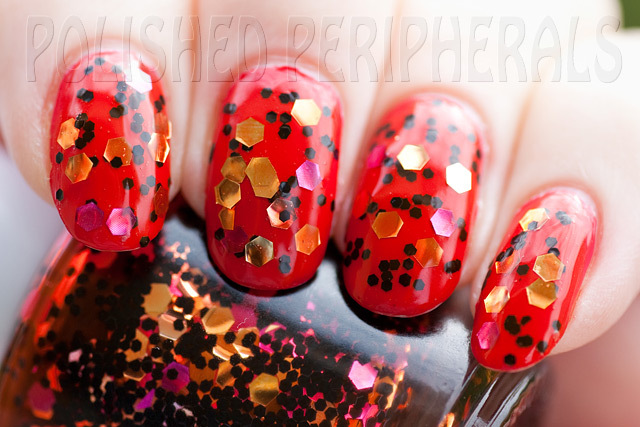 I had my nails glitterfied and photographed yesterday but didn't get to blog. We've had a rather full couple of days which have reduced my computer time. 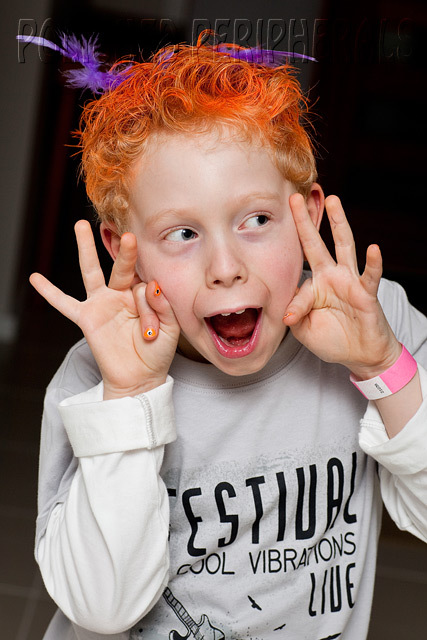 Friday night was school disco night for my 7yo and the theme was crazy hair and crazy socks. So of course he needed crazy nails too. Here's his crazy googly eye nails :) He had two eyes on each thumb. He did look pretty crazy. He wore some of my (cosmetic grade) franken glitters in his hair, stuck in with orange hair spray, and the socks he wore were some knee high rainbow striped ones of mine. He wore them over his trousers. Turns out he has the same size feet as me! He also wore a collection of glow sticks. He said he had the second best costume but I'm not sure that's just his opinion of if there was a vote. For my nails I wore something very special. 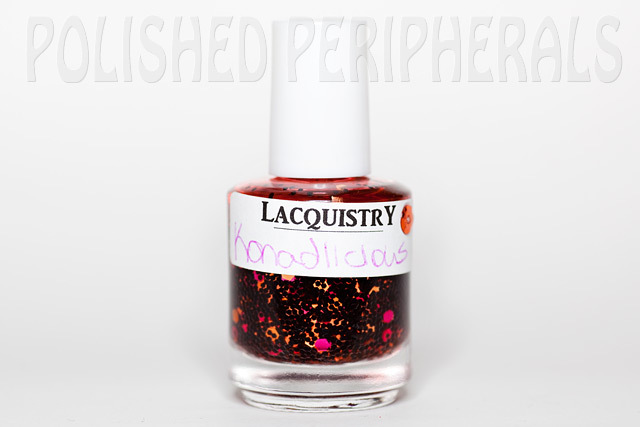 The Konadlicious by Lacquistry! 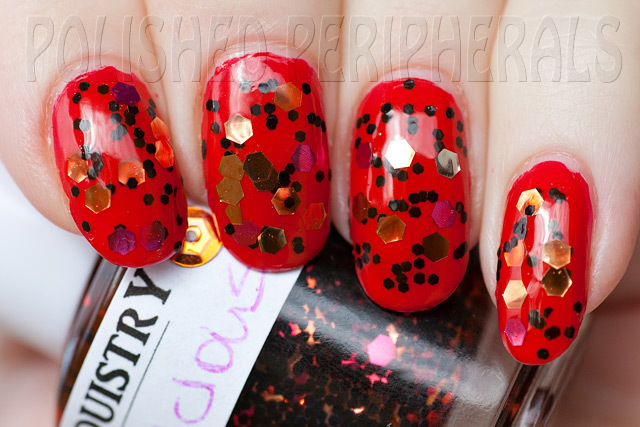 It's a one of a kind polish (yep the only one) created for the Konadlicious 3000 followers giveaway. I feel so special to have won this (and a little bit guilty that Carli doesn't have one). 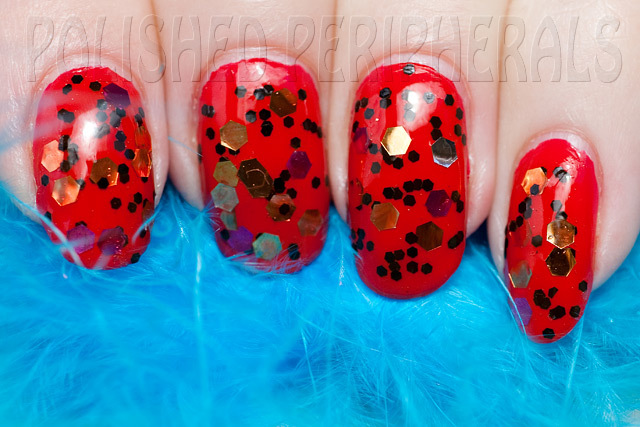 Carli has an amazing style and this polish is bold and glam like her (at least that's how she seems to me). I layered 2 coats of Konadlicious over Cult Nails Evil Queen which BTW I reckon would be a perfect red for Carli. She has beautiful shaped nails (which I like to think are similar to mine) and they'd look amazing in Evil Queen. Konadlicious went on pretty easily for a glitter with large pieces. I did have to dab a bit to spread out some areas where the hexes insisted on stacking on each other but other than that I was really happy with how well the glitter spread. 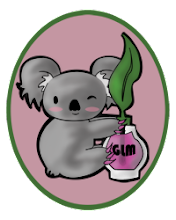 The base is lightly tinted red/pink which was lost over Evil Queen. Next time I'm going to wear this over orange which I think will make the glitter stand out more. I could have easily built up a denser glitter cover with more layers but I was happy with how this looked with lots of red showing. I topped this off with a coat of Orly Polishield and it's smooth and surprisingly flat (the Orly is a thin top coat). This survived the usual domestic bliss that comes with 2 kids, last nights disco outing and a trip to the beach today (in the rain with 4 hours of travel) without losing any glitter. If you'd like to try a polish from Lacquistry check out Jenna's facebook page HERE for news on when the store will be restocked and if you haven't yet go and check out Carli's blog HERE. I'm pretty sure I'm older than her but I sooo want to be her when I grow up, or even have half her sense of style. So cool that you have the only bottle in the world! I was late posting too, life gets in the way sometimes.